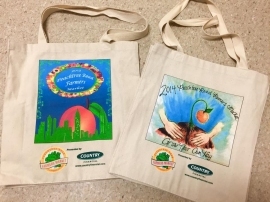 High school artists in Chicago have the opportunity to design a celebrated work of art and win a college scholarship as COUNTRY Financial and the City of Chicago Department of Cultural Affairs and Special Events launch their eighth annual Chicago Farmers Markets reusable bag design contest. Students are invited to show off their creativity by designing a reusable canvas bag to fit the “Live, Love, and Be Green” theme of this year’s design contest. Participants are encouraged to show the spirit of the city in their artwork, along with spring and summer imagery and regional market goods, such as fruits, vegetables and flowers. All entries must include the phrase “2015 Chicago Farmers Markets.” The student with the winning design will receive a $1,000 scholarship from COUNTRY Financial. Entries must be submitted to the address below by Friday, April 17 at 4 p.m. For more information, contact your school’s administration or visit www.CountryFarmersMarkets.com.